11. The graph depicts the growth of two white-footed mice populations, one exposed to hawks (population A) and one without hawks (population B). Are hawks a limiting factor for either mouse population? If not, then what other factor could be a limiting factor for that population? 12. Diagram the flow of energy through an ecosystem. Include the sources of energy, producers, consumers, and decomposers in the ecosystem. Understand the Question Be sure you understand the question before you read the answer choices. Make special note of words like NOT or EXCEPT. Read and consider choices before you mark your answer sheet. Question 11 Make sure you understand which mouse population is subject to predation by hawks and which mouse population do hawks not affect. Record your answers on a sheet ofpaper. 13. The colors and patterns of the viceroy butterfly are similar to the monarch butterfly, however, the viceroy caterpillars don't feed on milkweed. How does the viceroy butterfly benefit from this adaptation of its appearance? Under what circumstance would this adaptation not benefit the viceroy? Why? Use the illustration below to answer question 14. 14. 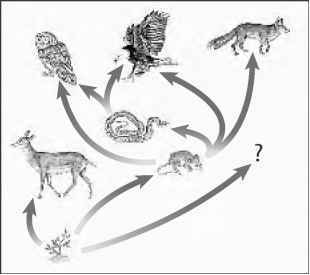 The illustration depicts a food web for a particular ecosystem. If the "?" is another mouse species population that is introduced into the ecosystem, explain what impact this would have on the species populations in the ecosystem. 15. Identify and explain possible limiting factors that would control the size of an ant colony. 16. 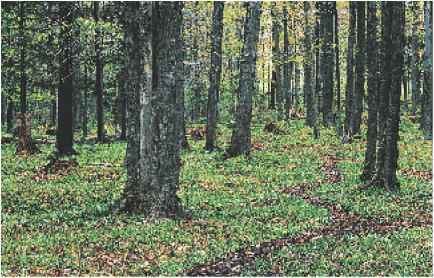 How would you measure the size of a population of gray squirrels in a woodland? Explain which method you would choose and why. Do you live in a dry, sandy region covered with cactus plants or desert scrub? Is your home in the mountains? Does snow fall during the winter? 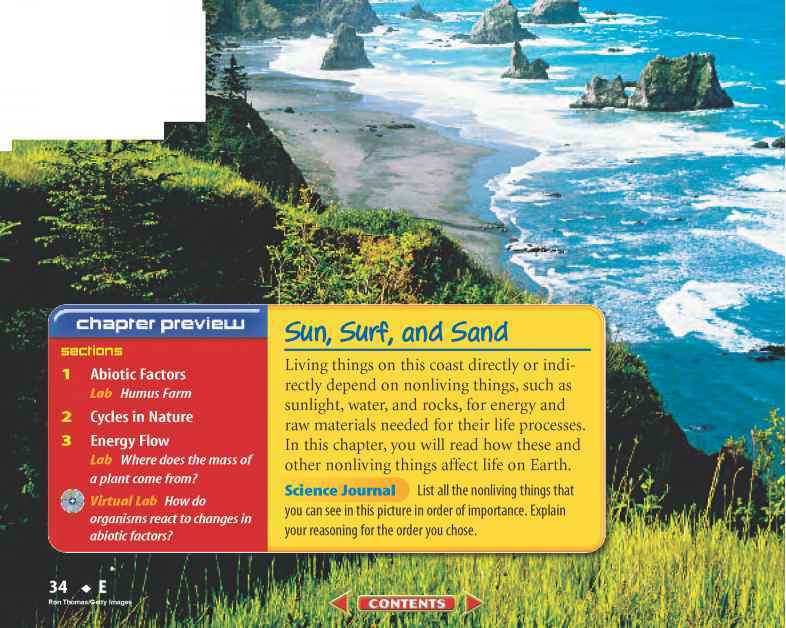 In this chapter, you'll learn why the nonliving factors in each ecosystem are different. The following lab will get you started. 1. Locate your city or town on a globe or world map. Find your latitude. Latitude shows your distance from the equator and is expressed in degrees, minutes, and seconds. 2. Locate another city with the same latitude as your city but on a different continent. 3. Locate a third city with latitude close to the equator. 4. Using references, compare average annual precipitation and average high and low temperatures for all three cities. 5. Think Critically Hypothesize how latitude affects average temperatures and rainfall. Nonliving Factors Make the following Foldable to help you understand the cause and effect relationships within the nonliving environment.